Benita has a B.A. (Hons) in Clinical Psychology. She has over five years of education research and project management experience. She is skilled in qualitative and quantitative research methods as well as in monitoring and evaluation. Benita has demonstrated a high level of understanding of education, development and training in her work at JET. 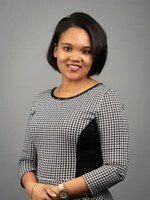 She has extensive experience in communicating with government departments, higher education institutions as well as international stakeholders for the purposes of research and evaluation. She is proficient in the use of statistical packages such as STATA and SPSS. Benita is responsible for the inception and implementation of monitoring and evaluation projects, data management and processing, and reporting and dissemination.